Earlier this fall, a reader asked, “Should freelancers bring a gift to a first client meeting?” Now that we’re in the holiday season, client gifts are top of mind…so what’s the savvy freelancer to do? Over at my other blog, Jake’s Take, I decided that it’s not in poor taste…and in fact, in this post I conclude that freelancers owe a debt of gratitude to Cooks Source editor Judith Griggs. In the comments: What do you think about the Cooks Source kerfuffle? 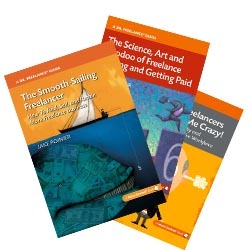 Freelance Forecast is Boomvang Creative Group‘s annual survey of creative freelancers—writers, editors, graphic designers, web designers, illustrators, photographers, PR pros and all varieties of solo entrepreneurs—as well as the clients who hire them for freelance jobs. If you did not participate this year, but would like to be notified about the upcoming Freelance Forecast in December, please subscribe to the email list via the sign-up box in the right sidebar.